Aptly described by kushwant Singh as India's Art Buchwald ( American humourist best known for his columns in The Washington Post ), Jug in turn is known best for his free wheeling Jugular vein and contrarion column ' Second Opinion' both for The Times of India. The first Asian to have won the Grand prize for Travel Writing, he is also the author of several books including Mind Matters, a collection of editorial page articles; Juggling Act, an anthology of humorous writings, Calcutta a city remembered and A Tika for Jung Bahadur- a collection of short stories. Among his many avatars, he together with artist Neelabh Banerjee the co creator of the comic strip Duniya Ke Neta. A separate collaboration with cartoonist Ajit Ninan has seen the creation of Like That Only, a twice weekly cartoon commenting on our life and times. 1. With the RBI anti inflation and the rupee getting weaker as we speak can the RBI afford to continue the lack of support it has been showing our currency? The RBI has so far not intervened to stop the rupee falling against the US dollar because it feels that with the eurozone crisis continuing, the international demand for dollars – very wrongly perceived to be the world’s safest currency – will only increase. As foreign funds invested in India withdraw to buy up dollars, India needs to keep its diminishing dollar stocks safely in reserve for emergencies or it might face a sovereign debt crisis like eurozone countries like Greece are facing. What the RBI should do, however, is to start lowering internal bank interest rates, which it has raised 13 times in 21 months in an effort to combat inflation. High interest rates act as a deterrent to expansion of business and industry, and this has led to a slowing down of economic growth from a projected 9% to 7%, or even lower. India needs to produce more, export more. If it can do that, the problems of both inflation and the falling rupee will be solved. 2. The Lokpal Bill brouhaha has raised innumerable questions and whilst answers for those may not be in the offing, individuals who love your writings want to know- whose Jugular vein would you go for? Starting off as an anti-corruption crusade, Anna Hazare’s Lokpal movement has, in effect, become an anti-Parliament and anti-government jihad. Taken to its logical conclusion it can only result in one thing: Anna-archy. 3. Are you for a presidential form of governance? Or do we need a more sprtan approach and wheelding out the not so fittest that are pulling back at the rungs of social progression ( evolution)? Am I for a presidential form of governance? Presidential, parliamentary, anything. But at least let’s have some form of governance rather that the total non-governance we’d had for far too long. 4. This Draconian form of ruling thinking acting living by our politicians and people in so called power, Justice Katjus attempt at reforming Indian Journalism. There seems to be a lot of lip service going around. How many more gedeankeexperiments can India take? Justice Kath – and many others in positions of authority like him – are walking, talking testimonies to the truism that power corrupts rational thought and that absolute power corrupts absolutely. 5. Repression , suppression and restriction people seem to have migrated from the villages from? Repression, suppression, and restriction aren’t confined only to our villages and rural areas, they’re everywhere. But yes, things are much worse in rural India than in urban India. 6. Justice Katju rexpressed his displeasure at the print media doling front page importance to the passing of one Indias most beloved actors, Dev anand. One might even say his views are the apogee of creative journalism. What are your views on the same? You met Dev Anand whilst he was shooting what would later turn uot to be a song that would reach anthemic proportions. Did you ever meet him after that? How did his passing affect you? I’d rather say that a national icon like Dev Anand features on the front page rather than a pompous windbag like Justice Katju. I met Dev Saheb again during the coronation of king Jigme Singhe Wangchuk in Bhutan in 1974, as I’ve recounted in my book. For his myriad fans, Dev Saheb hasn’t passed away; he’s immortalised in their memories. 7. Theres now a slew of IIT and IIM grads churning out carefully wriyten ( read marketable) books that have no literary sense to them at all. Written for fame and money and targeting the urban youth , they seem to now carry about a golden chip claiming they ave brought reading back to the masses. Why this dislluionment? Or is it all the glossy eefect of marketing? With a veritable and enviable collection of intelligent writers in one region why are our youngsters reading what can best be described as trash. The name of the game in book publishing has become marketing. So long as it gets people reading, I’ve got no problem with that. Are young people these days reading trash? Maybe. But at least they’re reading something, even if it’s only each other tweets. It shows that Gen Z is not totally a post-literate generation. 8. When I spoke with my peers and youngsters its bacuse they consider Indian writers to be dull and boring and sad and heavy. Are Indian writers banking too much onThe salabaility of poverty and pathos in India? If so, then how are they any different from Danny Boyle? Does being an Indian national make for a handy permission slip? Sure there’s poverty and pathos in India. But there’s also incredible energy, and hype, and an intense sense of life and living. India is the most exciting country in the world for a writer. Because, whatever else it might be, it’s never dull or boring. 9. Will you be attending the upcoming Jaipur Lit Fest? What are your thoughts on the rise of arts festivals across India? No, I shan’t be going to the Jaipur Lit Fest. I’m allergic to crowds, and the Jaipur Fest has become as crowded as the Kumbh Mela. Generally Lit Fest are a good sign that the habit of reading and writing – is alive and thriving in India. 10. What book are you currently reading and what book hold a special place in your life? I’ve just finished reading Jeffery Archer’s anthology of collected short stories. The book I love above all others is Jerome K Jerome’s Three Men in a Boat. 11. Which is your most disliked book of all that should have never seen the inside of a publishing house? A book that should never have been published? There is no such thing. All books – no matter how good or bad individual people think them to be – deserve to be published. 12. Do you enjoy reading and still read as you did when you began your journalistic career forty threes ago? Whats stayed the same and whats changed? Yes, I still red as much, if not more, now than when I started my career. What’s changed since then? There’s a lot more reading matter available now than before. So much for prediction that the reading/writing habit is dying out. 13. In your book you write about how by the yardstick of the world events and you not knowing what an ipone is, you haven’t changed much. But to survive and flourish in a carrer for forthy threes is no mean feat and that’s involves adaptation. How have you adapted to the changing times? How have I adapted to changing times? I suppose by being a survivor – like the cockroach, which has been around for a million years. 14. Do you now know what an iphone is? Do you know how to sms? No, I haven’t the faintest idea of what an iPhone is. Is it the opposite of a youPhone? I don’t like SMSing. It gives me a sore right thumb. 15. Your journalistic memoir, in the foreground has your journey as jug the writer, witty poignant, sharp but never vitriolic and fairly respectful In the background, a portrait of a genteel manIs etched. A man who feels deeply for the environment and the underdog. A man whose love for brindle suraiya gave her, her own chapter, posthumously. Reading your work is like meeting after an acquaintance after very long who, by the end of the book is much the like the dear friend one never knew they had. A friend who understands your pathos, troubles, happiness and general state of affairs. We cant let you at just this. Now we want to know you, sympathise with your troubles and laught with you at your triumphs or attempted move at impersonating yet another maharaja. 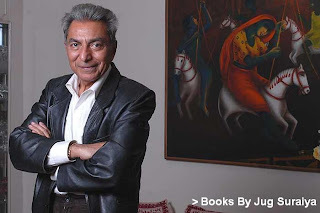 When can we now get to know Jug Suriya for Jug Suraiya? A memoir is in the offing… yes?? Is a memoir in the offing? I thought this book was a memoir. Will I do a more personal autobiography, outside my journalistic experiences? Maybe, if I feel there’s a readership for it. Is there? That’s not for me to say. That’s for my readers to say. So, all you wonderful folk out there: Do you really want another Jug Suraiya Story…? Why is no one at Indiaplaza responding to my complaints, reg refunds for order no IN3012111253?